Learn how to make your own beautiful and affordable concrete countertops. Granite or engineered stone countertops are nice, but they’re also very expensive. In our Concrete Countertops class, you’ll learn how to make polished and durable countertops that are very affordable and will bring style to your home. Learn the physics of concrete and the essentials of steel reinforcement. See the physical characteristics of a placing concrete and the tamping, vibrating, troweling, polishing and finishing that goes into making concrete countertops ALL in just one day. Learn how to avoid the most common problems to create timeless working surfaces. During the class we'll mix and pour two countertops (one in a mold and one in-place) and we'll pull a countertop out of its mold to polish and finish it. Learn subtle tricks of the trade to avoid cracking, voids, color variances and thickness changes. All tools provided but safety equipment is required (gloves, hearing protection, heavy workshoes, back brace as needed). Space is limited so please sign up today. The class requires a minumum of 10 students and Shelter Institute reserves the right to cancel if enrollment is too low. ENERGY is such a hot word today, everyone is asking how to make their homes more energy efficient and our favorite question is "which energy source is the most effective?" We've collected our favorite books on energy and put them all together in one place to help you find the information you need to make the best decisions about your home, lifestyle or business. The Energy Shelf is a collection of the best books we can find on energy topics. Whether you are trying to quantify your carbon footprint or looking for information on active or passive solar, wind energy, hydropower, biodiesel, or simply energy efficiency we've collected our favorites to offer in our bookstore. Add them to your own library and research or use this great deal for a gift. You select 2 books to purchase from that shelf. You receive 50% off the second book (of equal or lesser value)! You must buy the two books together by the expiration date to receive the discount. Simply type: BOOK OF THE MONTH CLUB: ENERGY SHELF and the title of the free book that you would like into the Message section of your order. Purchase two books from the Featured Shelf each month for six months and receive a 25%-storewide-discount card. We'll track your purchases and send your discount card with your last purchase (discounts applicable to in-stock items only, no special orders and cannot be combined with other discounts). Need a suggestion? Do you have a particular topic or question that your trying to research or perhaps this is a gift for someone who has been excited about a particular topic -- let us know and we can make a recommendation! Our knowledgeable staff spends hours combing through the books, reading and reviewing them for your benefit. Email us your inquiry and we'll make a suggestion of where to find the answers! The sale is applicable to in-store purchases as well as online purchases so if you’re in the area, please stop by for a visit! Sorry, but we cannot special order books as part of the “book shelf” program. Special orders are always welcome however, under regular circumstances. Concrete countertops are extremely popular for new construction and renovations because their beauty and versatility. Concrete creates a unique and beautiful end product that is environmentally sound, low cost and you can do yourself. In this free one hour workshop, we’ll discuss the many ways they can be formed, stained, ground and finished. Our discussion will address the benefits of concrete and how to overcome the limitations. We’ll have samples for you to see and feel and we'll walk through the process. You'll leave with list of materials and a cost estimate. 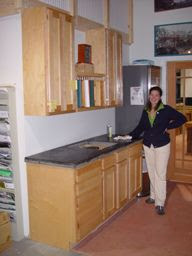 Concrete counter tops are attainable – we want to show you how! Contact us for details! This is your LAST CHANCE to take the Small Housebuilding Class in 2009! Join us for five invigorating days designing, framing and constructing this gorgeous 12x16 structure. It is the ideal studio, cabin, guest area, workshop (the list is endless). The leaves are just changing and the coast of Maine is a beautiful place to spend five days mostly outside, working with your hands, honing your housebuilding skills. You will learn layout techniques and carpentry skills, window and door installation as well as roofing and siding installation techniques. Call 207-442-7938 or email for additional information. Space is limited but there are a few seats left! 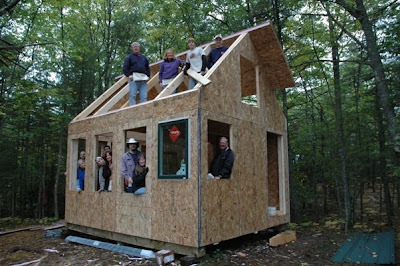 Those of you who have been dreaming about our 24x24 timber frame kit becoming your very own home, garage, barn, studio, workshop, boathouse, guest cabin, retirement home, escape, vacation home . . . YOU are in luck. We have three 24x24 frames sitting in our shop and we're taking $4,900 off of the list price bringing it down to $12,000 for the kit. This price includes the framing elevations for the structure, a foundation plan, all of the timbers with joinery pre-cut, and 2-inch tongue and groove decking for the second floor. These are Eastern White Pine Frames, square cut timbers with hand cut joinery. Each is crafted with tremendous care in one of our recent timber framing workshops in which approximately 20 people from around the world gather to learn the art of timber framing. Our instructors take tremendous care to teach technique and craft. At the end of the class the instructors go through and complete any unfinished joints, and clean and oil the timbers with an all-natural wood oil called Land Ark. Supplies won't last long so call today to reserve your 24x24 today at this very low price of $12,000.